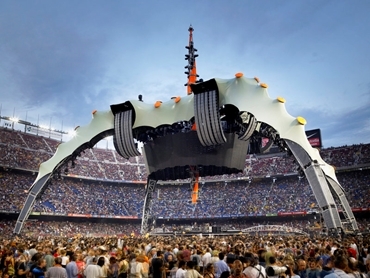 Trendsetting hydraulics in the Synchronous Lift System application are being used on the latest U2 concert stage. “The claw”, a 30 metre high stage construction on four legs, giving spectators all around the stage an unobstructed view of the band.With the help of Enerpac’s Synchronous Lift System, the Belgian company Stageco has constructed three gigantic, identical stages for the current U2 360° Tour. What makes this project special, is that high-pressure hydraulics are being used for the first time ever to assemble and dismantle the 230 ton construction - also known as “the claw”. Together with Enerpac (A Division of Actuant Corp) , Stageco has developed a unique system, based on Enerpac’s Synchronous Lift System, to raise the modular construction to a height of 30 metres quickly and safely. Being able to put on bigger and better shows than competitors provides a trump card in the entertainment world. Performances and tours by famous artists and bands have to look good, as is demonstrated by the glitz and special effects that are usually the main feature. The stage is crucial, and this is no different in U2’s 360° Tour. For this world tour, set designer Willy Williams and stage architect Mark Fisher came up with “the claw”, a 30 metre high stage construction on four legs, giving spectators all around the stage an unobstructed view of the band. The Synchronous Lift System has helped make it possible. One of the construction requirements was that the stage could be built and taken down again in a relatively short time. A ready-to-use hydraulic unit was required that would only need to be connected to the electricity supply and the operating computer. Together, the two companies came up with a highly effective solution which incorporated Enerpac’s custom designed Synchronous Lift System to use high-pressure hydraulics for the first time ever for such heavy loads. Stageco has made no concessions whatsoever as far as safety is concerned. The mechanical locking of the lifting platforms, for example, was an extremely important element. Enerpac’s computer-controlled Synchronous Lift System also fulfilled this requirement perfectly.